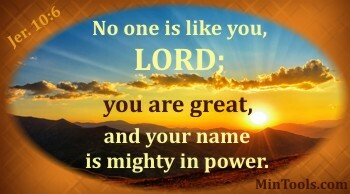 His Name … The Name of the Lord … is mighty in power! That name is powerful because of the Person who owns the name. His name signifies His presence. With His presence comes His power and protection needed for the change process. So, it only makes sense that whatever changes we make are done in His name. We’ve already considered four good reasons for keeping the name of the Lord at the center of the change process. Now let’s make sure we understand what it means to change in His name. Doing whatever we do, making changes in His name, means we’re relying on His presence and power to make decisions and proceed through the change process. We don’t put confidence in our circumstances and resources, in our own understanding and abilities, or in the good-will and aptitude of others. Rather, we . . .
look for help in His name (Ps. 124:8). And, when we make changes in His name, we find ourselves frequently calling on His name with hearts filled with gratitude and praise (Ps. 80:18; 99:6; 116:4, 13, 17).